When you run out of space on a horizontal plane, it's time to think vertical. In a garden, vertical means vines. Stick them in wherever there is room--disguise a gutter or grow them up the legs of a pergola. 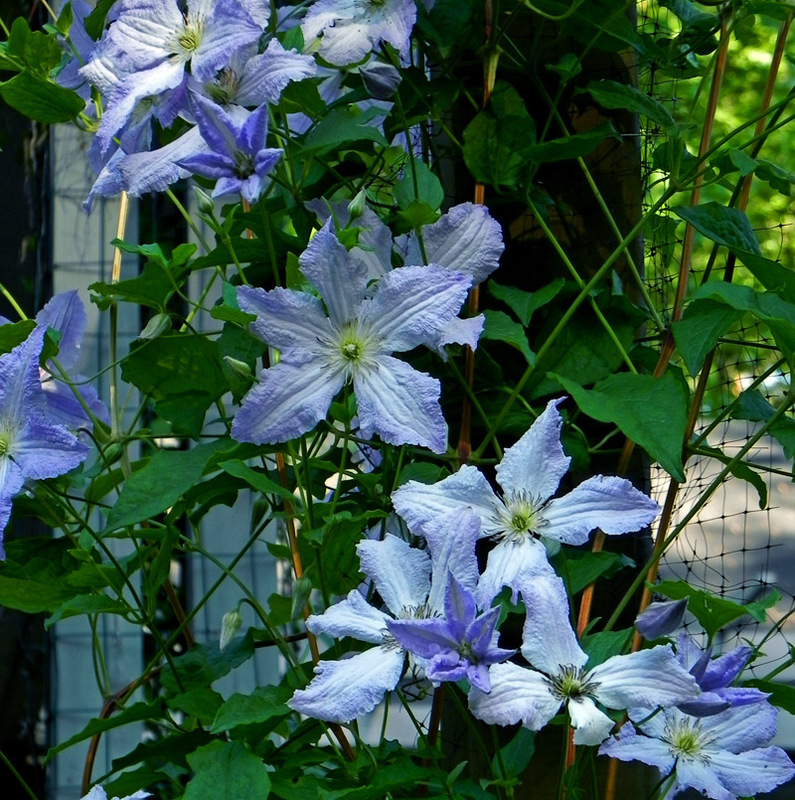 Clematis 'Blue Angel' took three years to nearly cover one of the pergola posts on the east side of the house. It's not as full as I'd like, but it's one of my favorites for its sky blue color, long bloom-time and big blossoms. 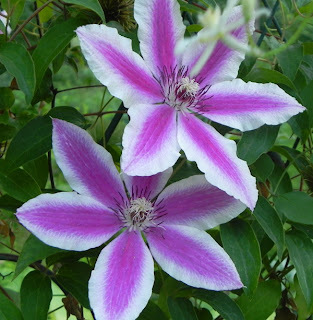 Clematis 'Carnaby' is an example of success with more shade than is optimum. Okay, so it doesn't bloom prolifically, but staged to the northeast of a redbud, it's not expected. On the other side of the trellis is Clematis recta purpurea, a pretty vine with an ugly name. 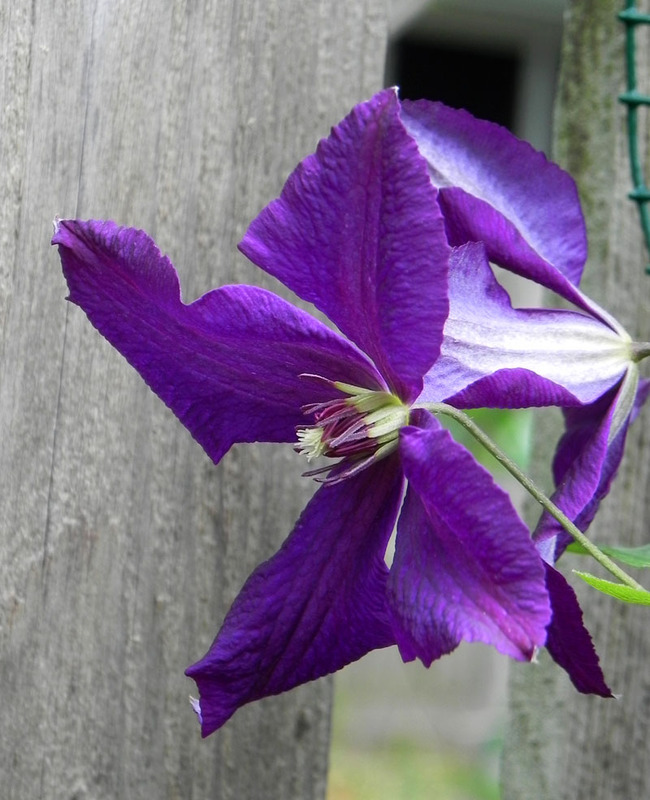 It's the early summer version of sweet autumn clematis only less likely to reseed every place it's not wanted. Clematis 'Avant Garde' should be appreciated up close. Its flowers aren't very large, you see, but they are interesting. With the central pouf of petals surrounded by reddish tepals, it's an eye-catching little number that hasn't grown to a size that will stop you dead in your tracks but it will make you look twice. It's been working hard to disguise a pergola pillar plus gutter. It's taking awhile to get going but in another year or so, I'm expecting it to really fill in. 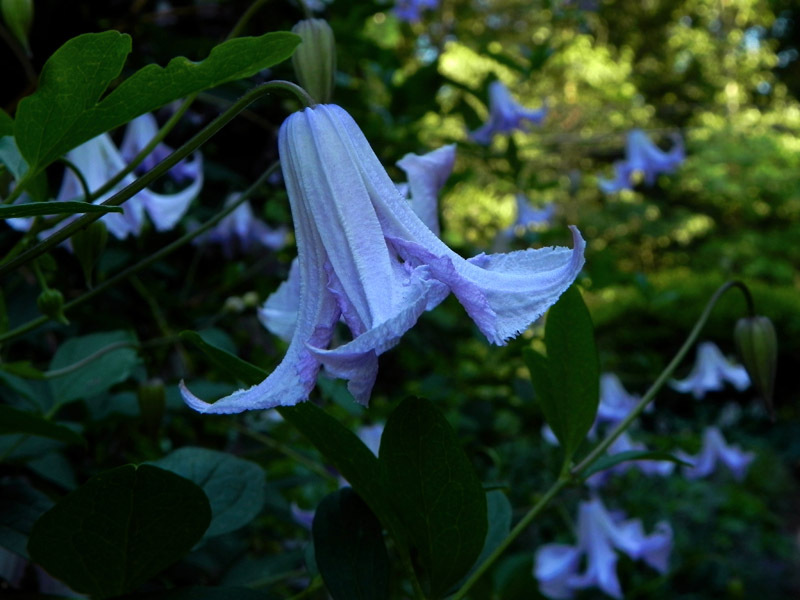 Clematis 'Rooguchi' isn't a climbing vine, but give it something to lean on and it will certainly do its best to impersonate one. Tucked into a corner bordered by a wooden fence and a tall metal trellis, 'Rooguchi' supports itself with a little help from a cadre of Oriental and Asiatic lilies. 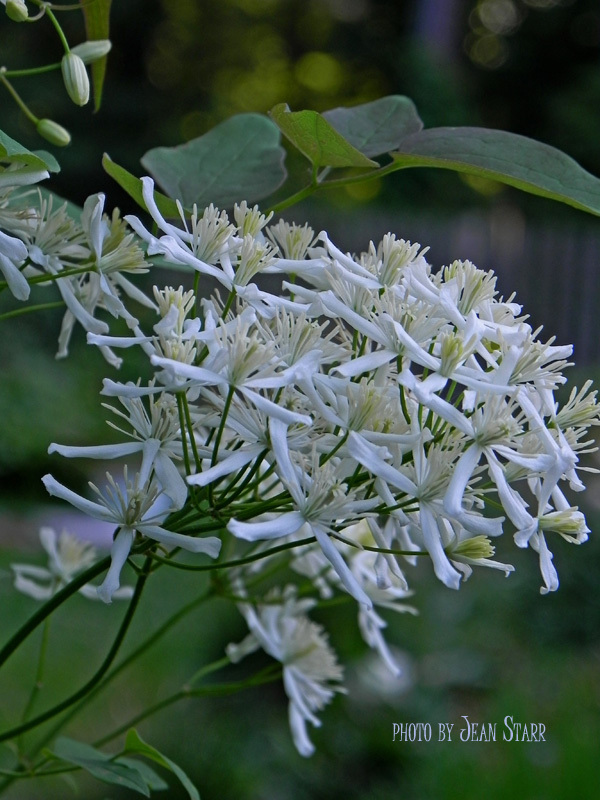 It's a long-blooming plant with attractive seedheads that decorate the plant along with the flowers. 'Rooguchi' is available through one of my favorite mail-order sources, Digging Dog Nursery. 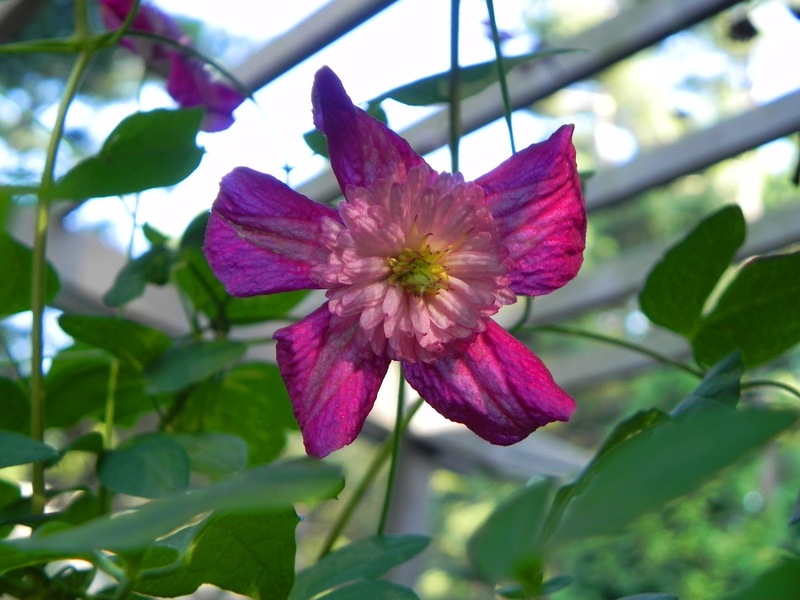 Clematis 'Betty Corning' has had several years to become established at the southernmost pergola post. It's not a very tall plant for me, making it perfect for decorating a post, whether it ends in a pergola or not. In the six years I've had it growing on the east side of the house, planted next to a sidewalk, it hasn't grown more than eight feet tall, but it's very bushy. Its flowers always make me smile, probably because they look like happy little dancers that flit around in mid-air.